The DMP 333 is a stainless steel 316L wetted parts pressure sensor for high pressure ranges from 60 bar (900 psi) up to 600 bar (9000 psi). Media Compatibility: SS316L process connection and diaphragm with FKM, EPDM or NBR. 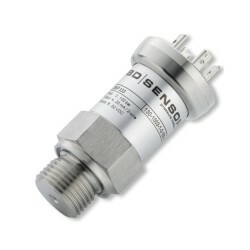 A fully customisable pressure sensor designed primarily for high pressure applications where a higher grade performance is required for research and testing purposes. The DMP333 incorporates a silicon piezoresistive sensing element which provides a highly linear measurement with very low hystersis and repeatability. To adapt the DMP 333 high pressure transducer to different environments a range of optional features can be chosen such as IS and SIL2 approved electronics, IP68 electrical connections for flooding protection and robust field housing for process plant installations. The DMP333 can be used on applications such as hydraulic test benches, presses, injection moulding machines, hydraulic actuation and vehicle hydraulic systems. The DMP 333 is accurate to 0.35% FS with options for 0.25% or 0.1% FS. Good long term stability of 0.1% FS over a period of 1 year. Monitor nitrogen cylinder pressure in a zone 1 area. Measuring up to a maximum pressure of 375 bar in a water filled pressure vessel. What is the SFF/lambda values for this transmitter to calculate the PFD for my loop? Will the DMP 333 sensor be 100mm long with the IS version, or does it have to be 133mm? The IS version without SIL2 approval is 100mm long. The 133mm length only applies to the SIL2 or the 0.1% accuracy versions of the DMP 333. 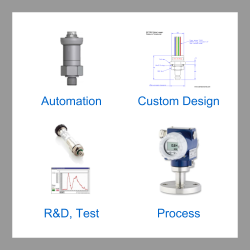 Please select the options you require for the DMP333 High Range Precision Pressure Transmitter in your application and request a quote. Send us your enquiry for DMP333 High Range Precision Pressure Transmitter to get assistance with this product type.